It's no secret that King Tut, even being just a boy pharaoh, had a thing for the bling. But now researchers have discovered that his footwear was not just stylish, but sensible. Research this year discovered that among Tut's many medical problems was a club foot. And now, new discoveries show that he had special orthopedic sandals that looked good, too. Click here to learn more and see a Tut sandal style show. They just keep digging up cool things in Egypt these days. After last week's reports on the findings of medical scans of King Tut's mummy, yesterday archaeologists in Egypt announced that they've uncovered an eight-foot statue head of Pharaoh Amenhotep III, grandfather of Tut. Here's a link to the full details, plus photos of this amazing find. While most pharaoh statues found these days are missing noses, this huge work has it intact. What's wrong with Tut? 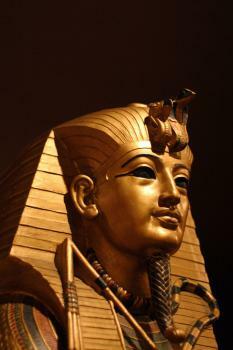 : CT scans and DNA tests conducted over the past two years have uncovered several major problems that contributed to King Tut's death: malaria, broken leg, a club foot and restricted blood flow to Tut's left foot.Courtesy SanandreasBeing a boy king of Egypt had it’s share of downs along with all the gold and glitter. CT scans and DNA testing conducted on the mummy to King Tutankhamun (King Tut for short) show that the boy pharaoh was suffering from several medical problems at the time of his death at age 19. The contemporary medical testing shows that Tut had a cleft palate and a club foot and was suffering from malaria and a broken leg at the time that he died some 3,300 years ago. The results were announced today and will be published Wednesday in the Journal of the American Medical Association. Medical experts have also been able to untangle the web of intrigue as to who Tut’s parents were, sort of. DNA shows that Tut is the son of the previous pharaoh, Akhenaten, and his likely mother is an unidentified sister of Akhenaten. In total, 16 mummies underwent CT scanning to get a better picture of who Tut was and what the times were like when he was alive. The 21st Century testing was able to answer more than half of Tut’s paternity questions by identifying his father. And while we know that Akhenaten’s sister was Tut’s mother, her mummified remains confirm Tut’s DNA, her identity is still unknown. It was not uncommon in New Kingdom Egypt for pharaohs to marry to their sisters. The findings put to bed once and for all long-held speculation that Tut was murdered. That idea was fueled by a hole in his skull, but a 2005 scan of Tut’s mummy showed that hole was made as part of the mummification process. The majesty that we associated with Tut based on the ornate furnishings found in his burial chamber may be a far cry from what life was like for the finals days of the boy king. The medical testing shows that Tut was a sickly teen who was done in by complications from the broken leg and malaria in his brain. On top of that, Tut had a club foot that likely required him to use a cane. In fact, 130 canes or walking sticks have been found among his burial goods, with some of the canes showing wear and tear. 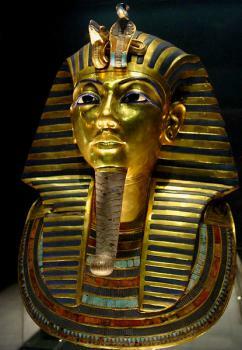 Tut also suffered from Kohler's disease in which lack of blood flow was slowly destroying the bones of his left foot. Another theory cleared up through the medical tests: Tut did not suffer from any medical conditions that would have given him female body characteristics or misshapen bones. Want to learn more? Here’s a Q&A with Egyptologist Zahi Hawass, secretary general of Egypt's Supreme Council of Antiquities, about the new Tut findings. And here is even more in-depth coverage from National Geographic. Bummed out that Tut was so sickly and need a pick-me-up? Do you really need a shot of Steve Martin's "King Tut" song right now? Enjoy (with a special guest appearance by Fonzie [aka Henry Winkler]). Maybe Steve needs to add a new verse to include all this new medical information. Tut's ancestory to be revealed: Later this month, authorities will be releasing the DNA test findings conducted on the mummy of King Tut. The research could determine who his ancestors were.Courtesy Bjørn Christian TørrissenIn what sounds more like a script from a Maury Povich show, archaeology authorities in Egypt have announced they will be sharing the findings of DNA testing done on the mummy of King Tut later this month. Zahi Hawass, secretary general of the Supreme Council of Antiquities in Egypt, has announced that a news conference Feb. 17 at the Cairo Museum will share the results of the testing, which could include determining the ancestory of the boy pharaoh. And here is a link to a previous Buzz post about the search for Cleopatra's tomb. Egyptian archaeologists this week announced the discovery of nearly 30 mummies among 52 tombs in Lahun, a site about 75 miles south of Cairo. Click here to see samples of the new discoveries and learn why mummy coffins are decorated the ways they are.